NIAGARA FALLS, Ontario – (December 17, 2018) – Fluance, engineers of serious performance, audiophile-approved Home Audio, Music Systems and High-Fidelity Turntables, launches the Reference Series High Fidelity Turntables, offering audio enthusiasts a pure, unparalleled analog experience that immerses the listener right in the heart of the recording. Four models launch today (RT82, RT83, RT84, RT85), each meticulously designed using the strictest standards to reproduce audio recordings exactly as the musician intended them to be heard. Each of the turntables include an Ortofon cartridge that feature elliptical diamond styli that elegantly trace the grooves of a record’s surface, resulting in precise and accurate playback. The RT82 includes the Ortofon OM 10 cartridge; the RT83 and RT84 include the Ortofon 2M Red Cartridge; and the RT85 includes the Ortofon 2M Blue Cartridge. The precision servo-controlled belt drive motor features a speed regulating optical sensor that continuously measures and adjusts variances in linear velocity and acceleration within a few hundredths of a percent at a wow and flutter of less than 0.1%. The decoupling of the drive from the plinth supresses motor vibrations and noise from reaching the stylus, resulting in accurate speed and significantly reduced rumble so records sound perfect at every play. The multi-layered wood chassis inhibits the transfer of unwanted resonance through the system. The 3 rubber spike-type, height-adjustable isolation feet minimize surface contact under the turntables, resulting in immunity to environmental vibrations and allowing for greater low-frequency signal pickup and improved imaging. 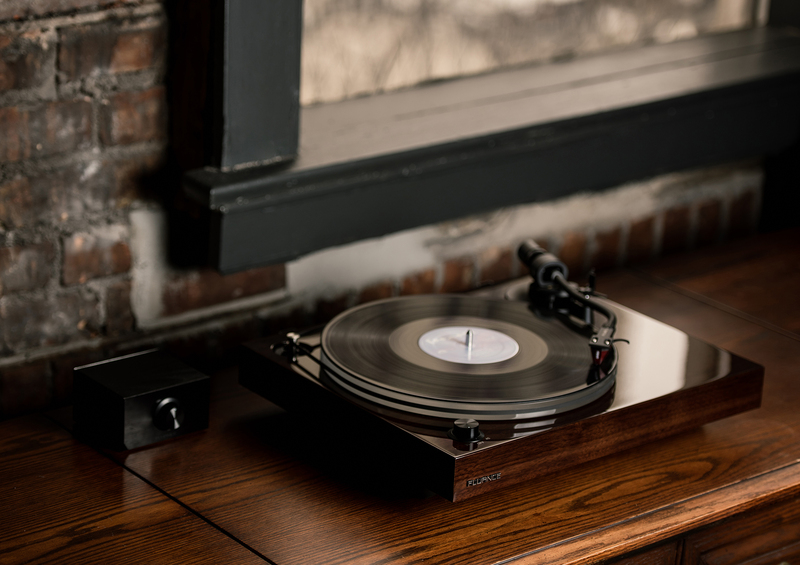 The RT84 and RT85 feature a frosted acrylic platter that enhances aesthetic and sonic qualities of the turntables. The high density and greater mass of the acrylic material provide stable inertia to achieve a more consistent speed while also damping unwanted vibrations by dissipating the energy. The RT84 and RT85 deliver a more 3-dimentional sound with tighter bass, a fuller midrange, and overall improved clarity. The balanced S-shaped tonearm allows for accurate tracking of record grooves and no electronics placed within in the signal path from the stylus tip to the gold-plated RCA outputs, contributing to pure, exceptionally detailed sound. The Reference High Fidelity Turntables, RT82 ($299), RT83 ($349), RT84 ($449), and RT85 ($499), are available now in black and walnut at www.fluance.com. For more information on the Reference Series High Fidelity Turntables and all of Fluance’s high-quality audio products, visit Facebook.com/FluanceAudio and follow @Fluanceaudio. Fluance is a North American-based audio brand established in 1999 that produces high end Home Audio, Music Systems and High-Fidelity Turntables. Fluance believes everyone should experience audio in its truest form, recreating the performance the way the artist intended. Utilizing only superior components and expert audio engineering, their products are a testament to the performance that can be achieved when a passion for music takes center stage. The perfect complement to any audiophile’s lifestyle, you’ll be enjoying live performances in your home for years to come. Fluance Audio products can be purchased directly at www.Fluance.com.